Uncle Fred just called me. I need to assign a special ring tone to him, because he only calls when it’s really, really urgent, as in life-or-death. Lately, it’s been too much of the latter. 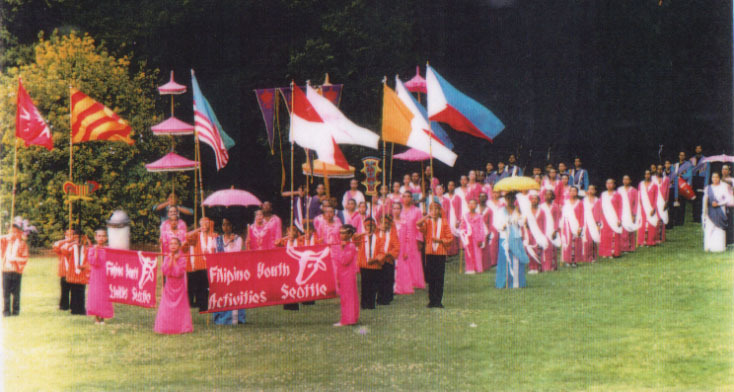 He called to tell me about the passing of “Uncle” Charlie Farrell, who, among other accomplishments, was a former Youth Director of the Filipino Youth Activities, Inc. (FYA), and a former Moderator of the FYA Khórdobah Drill Team. I had already heard the news from FYA friends on Facebook, but didn’t know the details about the services (see below): Funeral Mass, Saturday, February 14, at 10 AM at Immaculate Conception Church. I am so sad to hear about Uncle Charlie’s death. Even though he was about the age of my eldest sister, I still called him “Uncle” out of respect. Manong Ben Menor, of San Jose, wrote that when he was an FYA intern in Seattle, he admired how Charlie had a certain way with the Drill Team kids, how he could make them listen and stay in line. I feel blessed to have been one of those Drill Team kids. Charlie always took such good care of all of us. When my dad made my brother and me join the FYA, I was so young and pitiful and didn’t really know any of the rest of the kids. Uncle Charlie and Uncle Stan Harris were the first ones to befriend me. They were the only ones who really talked to me at first. On his way to pick up a bunch of other kids in the old FYA van, Uncle Charlie would pick my brother and me up first, and Uncle Stan would drive us home. During my first year on the team, they always let me sit in the front seat. I didn’t realize it until a year later that the back seats were where all the cool, older kids sat. I know now that they really put me up front to protect me from the backseat mischief. I loved sitting up front and being picked up first because Uncle Charlie would tell us all kinds of stories and play Motown music really loud so we could sing along. Then he would let us talk on the CB Radio with Buddah. (Gosh, do any of you remember what was Uncle Charlie’s CB handle?) On the way to parades, if Michael (“LSD”) was on the CB, all of them would start yelling drill team commands for the vans in the caravan to follow down the highway. Charlie would laugh loud, merging in and out, following all the red and white pom-poms tied to the vehicles’ antennas, while us kids would drum the beats on the back of the vinyl seats. When we had the 40th Year Reunion of the Drill Team 10 years ago, a lot of our friends remembered how Charlie lived in that van, had socks and chips everywhere; how we loved to eat with him, how he used to tell ghost stories in the basement of Immaculate so we would hurry up and put the equipment away quickly. I remember his loud laugh, big Santa Claus cheeks and smile. If you ever asked Uncle Charlie for a favor, he would do it if he could. He was right. The next year, before I made the squad, when I had to volunteer again, they told me to go file papers for Uncle Fred upstairs in the archives so I could learn something different. (This was before the archives were known as the FANHS National Pinoy Archives.) Uncle Charlie always wanted us to do well, to study, and stay out of trouble, so we did; he told us that if anyone ever messed with us at school, just to tell him and he would take care of it. Although I never had to ask him to fight my battles, I carried all of those lessons with me, when I got teased at school, when I learned how to drive, when I worked various office jobs to pay for college, and when I used the archives for my research in graduate school. Along the way, whether he knew it or not, he was always there for me, as well as many others. How ironic for Uncle Charlie’s funeral to be on Valentine’s Day, since he was such a loving, giving person. He taught me to love life. He was one of the first Pinoys that I met who wasn’t too “macho” to laugh and talk about romance. I remember when he met Auntie Carmen and how he told us, “I’m in love and I’m getting married!” We cheered. We were so happy because he was so happy. I am sure many others, especially those who are older and who were closer to him, will have a lot more stories to tell than I can. He had that gift of bringing people together and making us all smile. Years later, I lost touch with Uncle Charlie after I moved away from Seattle, but my mother and I would sometimes bump into him at church or at a community function. He would always kiss my mom and say, “Hi Auntie, how are you doing today?” And she would tell him about her gout or her knee pains. He would tell her that he would pray for her and that she should just take it easy. Little did we know years later, he would have those same ailments. Last June, when my mom was dying in the hospital, Uncle Charlie was in that same hospital, on another floor getting kidney dialysis. Folks told me to stay by my mom’s side, that Charlie would pull through it. A few days later, when I was at the FANHS office writing my mother’s eulogy, Uncle Fred got a call from Auntie Carmen and he sped back to the hospital right away to be by Charlie’s side, only to be sent home because Charlie was undergoing more tests and treatments. He pulled through until last Sunday. 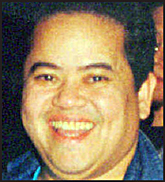 Charlie was more than our chauffer and self-appointed bodyguard, he was our counselor, one of the few who would really listen to our problems and not belittle them; he was our leader, our teacher, our role model, our minister, our friend, our big brother, our Santa Claus, and that true Pinoy uncle every kid should be lucky enough to have. We were all so lucky to have him, and I just hope that he knew that. Today would’ve been my mother’s 82nd birthday, but I cannot shed any more tears. Instead, I am lighting a candle and saying a prayer for her and for Uncle Charlie, because I know that both of them are tsismising and eating up a storm in heaven, smiling down on all of us. If I could be there for the funeral on Saturday, I would wear my FYA lanyard and be proud to stand with the Drill Team as honor guard, as I hope many of my friends will do. Halina, halina, mga kaliyag. . .
Dios ti agnina, at sa inyong lahat. . .
Maraming salamat, salamat po, Uncle Charlie. is a Trustee of the Filipino American National Historical Society. Asian American and Filipino American Studies since 1992.